i'm filling in for angi since she is incapacitated. i'm sure most readers of this blog already know but i thought i'd put the news out there for the general public that johnny joined the laz this morning at 8:15, weighed 6 lbs 14oz and was 21.25 inches long. he is just as long as alexandra was when she was born but he's a bit thinner. he told me that he does not plan on being the shrimp of the family and will quickly surpass her in height and weight. that's it for now but i'll leaving you guys a blurry pic of johnny before i go. hopefully we will be posting some better pics soon. I am 38 weeks and went to my doctor today for my weekly appointment. I am still 2cm dialated but I am now 100% effaced. He could come tomorrow, he could come in two weeks, all I can do is wait at this point. If I haven't had the baby next week I will post another picture of myself. I don't think I have changed much since my posting last week. My Dad comes this Sunday and will be here through the end of February. We are super excited for his regular, monthly visit. My mom will come down here for a week or so when I have the baby. I will be so excited to see her too. Hopefully, my next posting will be that I have had the baby! Here I am at 37 weeks! 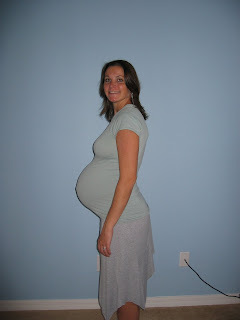 I thought it would be fun to share a picture of me roughly around the same time when I was pregnant with Alexandra. I think I have carried them pretty much the same. I went to my weekly appointment today and the doctor doesn't think I am going to make it to my due date. I am 2cm dilated and 80% effaced. We'll see if he is right or not. I am getting excited! Alexandra got some new sunglasses! And she thinks she is sooooo cool! I will be 36 weeks at the end of this weekend. On Monday I start my weekly visits to the doctor until I have the baby. I can't believe that in a month, possibly less, I am going to have another baby! I am excited to see Alexandra with the baby. She knows which room is the baby's and if you ask her where the baby or her brother is right now she points to my belly. I don't think she fully understands what is about to happen and that she is going to have to share us with him. It will be an interesting adjustment! We'll see how she does. I think I may have to fight with her to hold him. We recently saw a 3 month old baby and she wanted to hold him the entire time! She got so upset when I wanted to hold him! Alexandra is talking up a storm, saying new words everyday and starting to make short sentences. Her latest and favorite word is "mine". We laugh at the things that she thinks are "hers". We came home last weekend with new furniture for the patio and she kept declaring it as hers! My sister Michelle is pregnant again with her second child! Yeah! We are super excited for her. My brother's wife had her baby, a boy name Donovan, two weeks ago. I won't be able to see him for a few months but I've seen pictures and he looks like adorable. With Donovan, ours on the way and now my sister, my parents are in grandkid heaven!